FEATURE – Do CEOs see lean as a strategy? The author – himself a CEO for many years – debunks the misconceptions often preventing senior leaders from doing so. Is lean a strategy? I did not think so a few years ago, when I embarked on a lean journey as the CEO of Danfoss Water Controls. I was heading a very successful business at the time: we had high profits and our management style and results were often praised by the media. Our strategy, as a valves and controls manufacturer, was to offer a wider range of products to our customers than our competitors. Indeed, our growth was impressive, but it came at a cost: huge inventories and a struggle to make so many products available at all times. That’s when I started looking for a way to reduce stock and improve our customer service, which was deteriorating as quickly as we were growing. Lean quickly appeared as a great approach to better execute our strategy. At the time, however, I was only looking for something that would bring effectiveness and efficiency to our process, and nothing more. After achieving outstanding results for years, however, I finally realized that lean had actually become our core strategy, guiding our every move and informing every decision we made. As usual, the numbers spoke for themselves: customer service improved by more than 30% and we didn’t just “reduce” our inventories, we actually slashed them by around 60% – something of a paradox in traditionally-managed (non-lean) firms. As a result, we were able to free up a lot of cash that we reinvested in the development of new, innovative products, which substantially broadened our customer base. An extra gift from lean was that absenteeism and work accidents were being drastically reduced. But there’s more to it than just great results. The reason I say that lean had become our strategy is that we realized it was giving us what successful strategies normally deliver: more attainable victories by freeing up or simply not wasting resources and avoiding unnecessary investments, and the possibility to “dream bigger” because new capabilities are developed, which generate new opportunities for value creation (all of this was underpinned by a constant focus on customer satisfaction, people engagement and shareholder support). The moment of realization came when the management of a company we had just acquired produced a list of key investments (larger facilities, hiring more people, etc.) that, in their mind, would help them grow. Aware of our previous successes, we decided to go fully lean in the firm: in four years we doubled their sales, without hiring more people, without expanding the facilities, and without investing huge sums of money. These results far exceeded our expectations, and all of sudden lean looked like something more than a just a “method”. Since my a-ha moment, I have been trying to convince fellow CEOs – even the very successful ones – to view lean as a strategy, rather than a mere set of tools (which also explains my contribution to The Lean Strategy book, co-written with Michael Ballé, Dan Jones and Orry Fiume). And to adopt it as a strategy from the get-go, rather than going through the long journey of discovery I experienced. In my conversations with CEOs, I have identified the need to share a common definition of the term ‘strategy’. Most of the time, CEOs tend to agree on this: first of all, a solid strategy starts with defining a useful and sustainable purpose, which can weather uncertain times without losing its integrity and value. Secondly, a solid strategy helps you to reach your goals by choosing a path reflecting the resources you can mobilize. Finally, a solid strategy makes sure that the journey doesn’t wear out the travelers, who will be able to adapt to any change of course and never lose sight of the purpose. While discussing the implications of such a definition with many colleagues and fellow lean thinkers, I have seen two main obstacles to the idea of lean strategy popping up. So, let’s try to debunk these misconceptions. A STRATEGY WITHOUT A STRATEGIST? As CEO and “premier” strategist, you have the power to define and drive the strategy, and a duty to deal with a reality that rarely matches your intended outcomes. The first issue then, as the environment around you changes with time, is that your strategy – your purpose, path and journey – must be adaptable, not rigid. This calls for a profound change in thinking and acting. I learned it the hard way. Before lean came into the picture, our well-intended top-down strategic solutions created growth with a big price tag (holding large inventories and needing warehouses to keep them), but also undesired operational problems at the gemba – quality issues, customer complaints, delays, ergonomic problems, to name but a few. My first reaction was denial – I would blame people, their managers or the processes. Hard discussions with my sensei gradually woke me up: yes, I had the power and the right to design a strategy, a purpose and a path, but I was refusing to share the journey, to acknowledge the real situation as my people experienced it (and they were trying really hard to make it work for customers and for themselves). I had the power, but I had failed to observe, listen and learn what was happening for real. Back then, my idea of strategy stopped at the Boardroom door. Beyond that door was a strategy without a strategist – an orphan strategy, if you will. This was my first big lean lesson: the people’s journey is my journey, and the execution is a critical part of the strategy. Sharing the journey, as I finally realized, was not something to fear, but an opportunity to progress. It meant I had to start leading from the ground up, slowly abandoning my rigid beliefs and accepting the dynamic and systemic nature of a lean strategy through open dialogue and active experimentation. Over time, I felt more and more comfortable with deploying my “helicopter view”, that careful balance between detailed action and global vision. I then realized that leading from the ground up required an even more radical change: abandoning the classic and predictable top-down process of “defining, deciding, driving and dealing” and embark on a new type of experience that starts with asking and sharing questions and intentions, finding problems, facing up to and framing challenges, and finally forming solutions. This is major shift for CEOs, explained in great detail in chapter 2 of the book. For me, it meant accepting that executing the strategy in a traditional manner was impossible, admitting I had no clue how to do it otherwise, and finally being committed to learn by running experiments with my teams, day after day. The second challenge CEOs often experience is in nurturing their strategic journey at all times. The difficulty there lies in the flexible and renewable resources you need to adapt to uncertainty and the unavoidable detours you will encounter along the way. I shared that epiphany with the supplier’s CEO: I also realized I now had to view and treat people differently. A lot has been said and written about respect for people – indeed, the business literature is full of expressions of good will and great intentions towards “human capital”, from happiness at work to collective intelligence – but the truth is that it is not just lubricant for the company’s social mechanisms, but the core substance of its strategy. This is where the profound differences between a classical strategy and a lean strategy lie. In my early lean days, even though I knew that my strategy would have to deal with uncertainty and changing conditions, I saw my role as one of presenting the vision, expecting people to adhere and align to it, and choosing those fit and competent enough to carry out the management of the execution or the execution itself. I knew that we would have to adjust, but I trusted the command-and-control chain we had in place would take care of it. In a way, I saw people as mere resources to align to the vision and to execute the processes. My strategy came first, people came second: mine was a de facto people-free strategy, which certainly felt pretty secure, in that it didn’t depend on the volatility of human nature. What opened my eyes to this problem was the kaizens we were working on: not only were the people leading the change, they were also transforming the whole equation. In some instances, the results were astonishing, including changeovers that went from eight hours to twenty minutes and impressive quality breakthroughs on products (all with instant strategic impacts). Even when our experiments failed and the kaizens were less than successful, the learnings were incredible – proving the power of this daily, spectacular process for individual and collective learning that was gradually changing the story of our company. At that point, I realized that lean is a people-centric strategy designed and powered by human capital at work, creating renewable resources to progress on the journey, relentlessly checking the purpose, choosing and designing new paths. 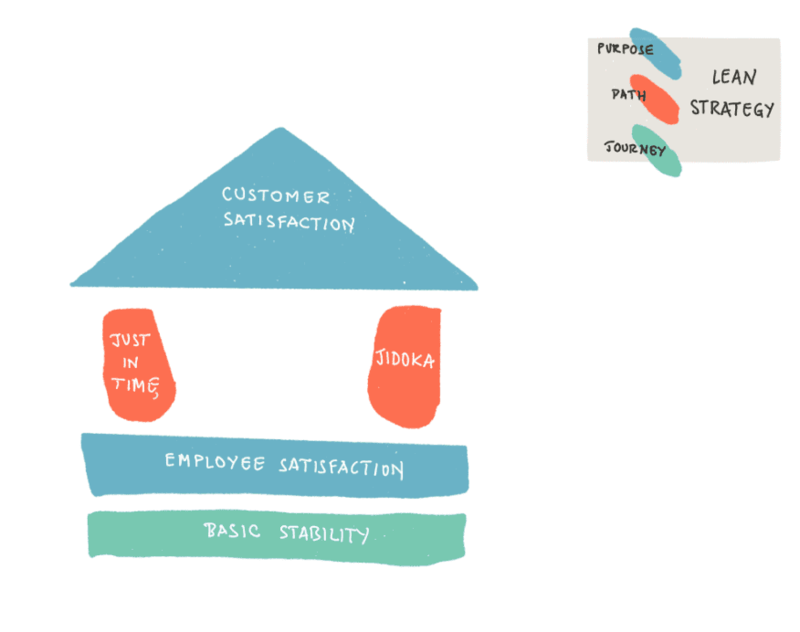 As for the TPS House, which I had seen previously as just a collection of tools, it was now a powerful strategic framework encompassing the three dimensions of strategy: purpose (customer and employee satisfaction and society at large), path (just-in-time and jidoka), and journey (basic stability through standards and kaizen). Convincing the CEO to embark on the journey and build her strategy on people learning and self-development are the main conditions that one needs to meet to make lean the company’s strategy. It may be hard to do, but once those gates are open, there is no turning back. Jacques Chaize was CEO of Danfoss Water Controls, a French/Danish water valve specialist that served as a model of lean practice. He is an author and keynote speaker, also active in business associations. 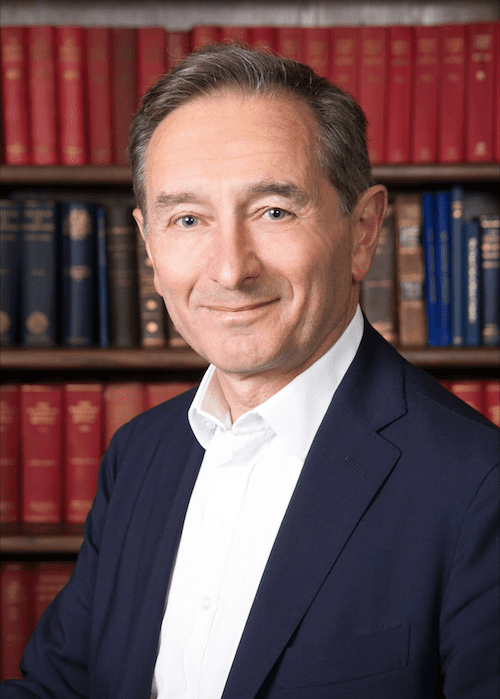 Jacques currently serves on the board of a few companies in Europe and North America. He also advises leaders engaged in using lean as a strategy. He is author of The Door to Change Opens from Inside (in French) and Quantum Leap, and co-author of The Lean Strategy. FEATURE – This powerful article explains why we should place learning at the heart of our lean strategy to build better products – something Toyota has always done – and how management fits in the picture. Can lean support strategy as much as it does operations? FEATURE – Does lean management help us at strategic level as much as it does operationally? What’s the strategic thinking behind lean thinking? 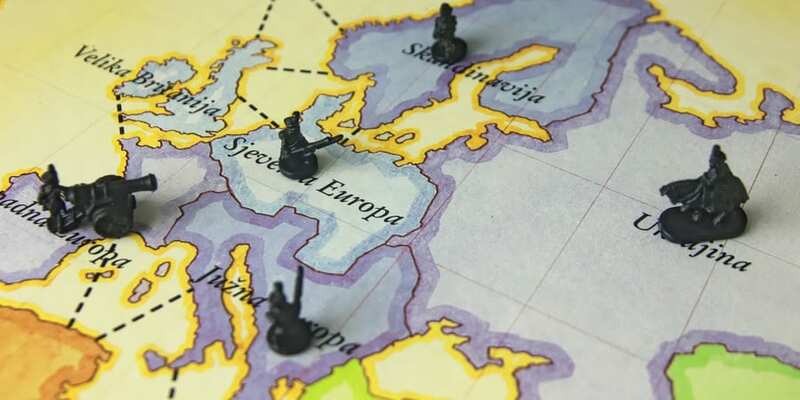 Michael Ballé answers these questions by looking back at some of history’s great military strategists. NOTES FROM THE GEMBA – The author visits an SME specializing in the instalment of electrical equipment. Its CEO has learned that integrating lean in their strategy can lead to sustainable growth.